Synthetic peptide within Human TRAF6 aa 50-150 (N terminal). The exact sequence is proprietary. Jurkat and HAP1 whole cell lysate. Human colon adenocarcinoma. 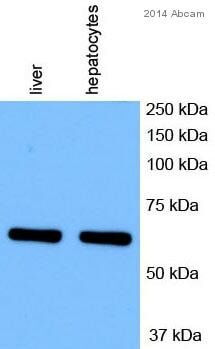 This antibody is unsuitable for detecting TRAF6 in tissue lysates. Our Abpromise guarantee covers the use of ab33915 in the following tested applications. WB 1/2000 - 1/10000. Predicted molecular weight: 58 kDa.Can be blocked with TRAF6 peptide (ab183540). Lanes 1 - 4: Merged signal (red and green). Green - ab33915 observed at 65 kDa. Red - loading control, ab8245, observed at 37 kDa. Overlay histogram showing HAP1 wildtype (green line) and HAP1-TRAF6 knockout cells (red line) stained with ab33915. The cells were fixed with 4% formaldehyde (10 min) and then permeabilized with 0.1% PBS-Triton X-100 for 15 min. The cells were then incubated in 1x PBS / 10% normal goat serum to block non-specific protein-protein interactions followed by the antibody (ab33915, 0.1µg/ml ) for 30 min at 22°C. The secondary antibody used was Alexa Fluor® 488 goat anti-rabbit IgG (H&L) preadsorbed (ab150081) at 1/2000 dilution for 30 min at 22°C. A rabbit IgG isotype control antibody (ab172730) was used at the same concentration and conditions as the primary antibody (HAP1 wildtype - black line, HAP1-TRAF6 knockout - grey line). Unlabelled sample was also used as a control (this line is not shown for the purpose of simplicity). 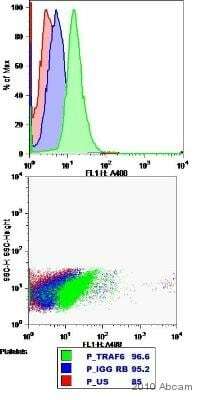 Flow Cytometry - Anti-TRAF6 antibody [EP591Y] (ab33915)Image courtesy of an anonymous Abreview. ab33915 staining TRAF6 in Human platelet cells by Flow cytometry. Flow Cytometry analysis of Jurkat (human acute T cell leukemia) cells labeling TRAF6 with purified ab33915 at 1/240 dilution(10ug/ml) (red). Cells were fixed with 4% paraformaldehyde and permeabilised with 90% methanol. A Goat anti rabbit IgG (Alexa Fluor® 488)(1/2000 dilution) was used as the secondary antibody. Rabbit monoclonal IgG (Black) was used as the isotype control, cells without incubation with primary antibody and secondary antibody (Blue) was used as the unlabeled control. This antibody is unsuitable for detecting tissue lysates. Publishing research using ab33915? Please let us know so that we can cite the reference in this datasheet. Thank you for contacting Abcam and for your interest in ab33915. I can confirm for you that this is indeed a rabbit monoclonal antibody. Rabbit antibodies are generally high affinity and are an ideal species to choose for making antibodies against mouse and rat proteins as many antibodies made in mice or rats will not react against mouse or rat proteins. From our experiences the rabbit immune system appears to be capable of generating affinities against small epitopes which are not recognized by the mouse. I hope this information is helpful. Please do not hesitate to contact us if you have any additional questions or concerns. Can you recommend EasyLink conjugation kits for bothe IRAK1 and TRAF6 kits, please. Our IRAK antibody ab238 will be compatible with any of our EasyLink conjugation kits. The full list of available sizes and fluorophores can be found at https://www.abcam.com/EasyLink, but for example you could use the FITC conjugation kit ab102885. The TRAF6 antibody ab33915 is a rabbit monoclonal. Because the binding affinity of rabbit IgG is much, much higher than that of mouse IgG, a rabbit monoclonal antibody will be suitable for use at a far lower concentration. For that reason, ab33915 is sold at a very low concentration. The EasyLink kits can only be used with greater than 10ug of antibody per conjugation, in a volume of 4-10ul. That being said, even with the low concentration, we will guarantee this antibody to work at a dilution of 1:50 for Flow Cytometry. I hope this helps, please let me know if you need any other information. I would like to know whether there are ELISA kits available for measuring TRAF6, IRAK1, STAT1 and IRF5 in serum? We have several antibodies to IRAK (ab47843 and ab5522), STAT1 (ab118848 and ab64913), and IRF5 (ab33478 and ab49056)that would be suitable for use in ELISA, but none of our TRAF6 antibodies have been validated for this purpose. If you would like to test one of our antibodies in an untested species or application, I would be happy to send you more information about our testing discount program. I would like to know whether you have any flow cytometry antibodies for TRAF6 and IRAK1? Or for TRAF6 and IRAK1 protein studies in whole or peripheral blood? ab238 rabbit polyclonal to IRAK; tested for use in WB, IP, IHC-P, Flow Cyt, ICC/IF; reacts with human, mouse, and rat. ab33915 rabbit monoclonal to TRAF6; tested for use in WB, IP, Flow Cyt, IHC-P; reacts with human, mouse, and rat. Both of these antibodies are unconjugated, but you could use on of our EasyLink conjugation kits to directly conjugate ab238. If you are looking for an isotype control, you may be interested in ab27478. The rabbit monoclonal ab33915 typically has a very low concentration because rabbit monoclonals have a much higher binding affinity than mouse monoclonals, but the hybridomas produce less antibody. For this reason, the concentration will be too low for use with our EasyLink conjugation kits, but it can be used with an anti-rabbit IgG secondary antibody.